When I was a small boy back in the sixties, I used to hear of trains that one could take if one wanted to go to Baguio up north or Bicol down south. 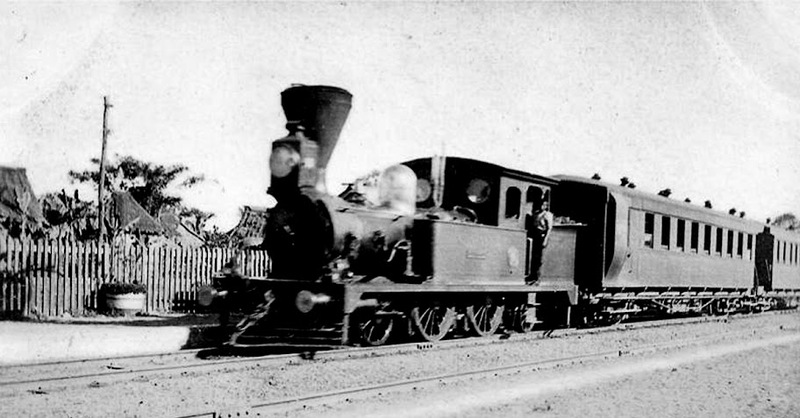 In Batangas, even then, public train service was already non-existent. That there used to be one, I had always assumed. 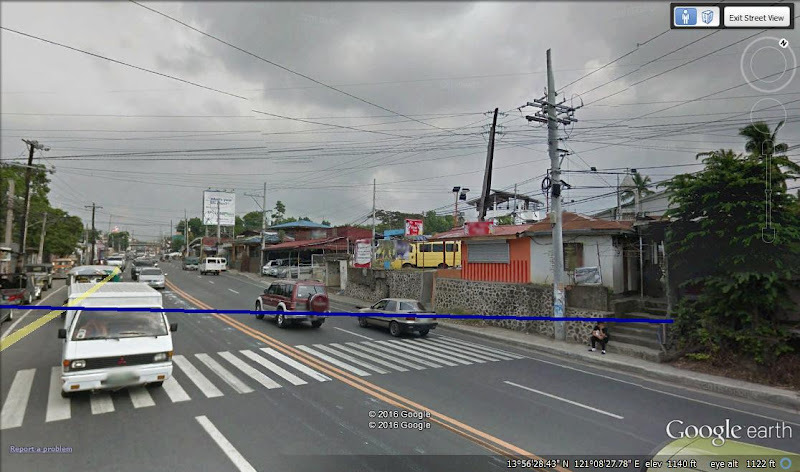 After all, the school buses that ferried us to and from Fernando Air Base and Our Lady of the Rosary Academy uptown in Lipa would always slow down before crossing the railroad track that intersected the gravel and asphalt road at that curve in Tambo in front of the chapel. The blue line represents where railroad tracks used to intersect the road in Tambo. Image credit: Google Street View. When I had already transferred to intermediate school in La Salle, once in a while our classes would be distracted when a train passed along the tracks behind the school property. Everyone, naturally, looked out the windows. These trains, however, had open cargo cars laden with sugarcane which, or so we heard it said, were being ferried to a refinery in Canlubang. But there was also a station reminiscent of those one sees in American cowboy movies located almost at the corner of the street behind the school property, what is now called Lorenzo Ruiz Road leading to Canossa Academy. So we all assumed that there were passenger trains that once passed through. 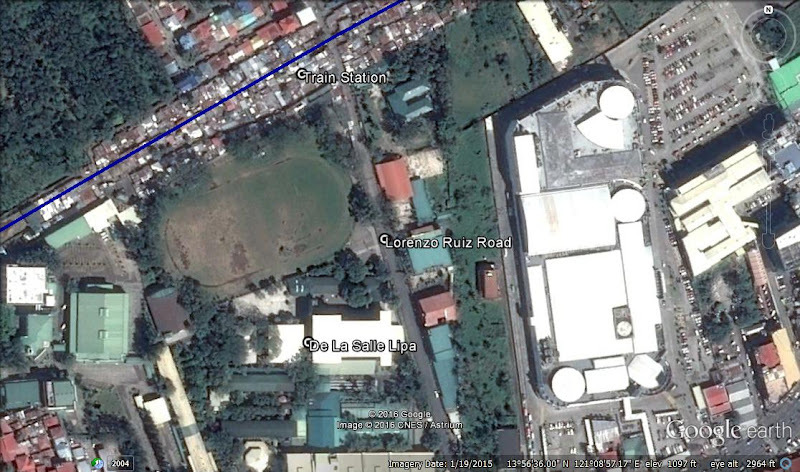 The old Lipa train station used to be behind De La Salle Lipa at the corner of what is now Lorenzo Ruiz Road. Image credit: Google Street View. Click to enlarge. In high school, I joined the Citizens’ Military Training hike to the SOS facility in barangay San Vicente, and we walked along the train tracks to get there. The tracks ran behind the SOS compound. We all conjectured that the tracks must have run all the way to Batangas City; but nobody really knew. Thanks to the wonder that is the Internet, now I have confirmed that the tracks did, indeed, run all the way to Batangas City and probably even as far as the Municipality of Bauan. Although the Batangas line has been dead for some time, the tracks are still fairly easy to trace on Google Earth. Inevitably, the line has been encroached upon by squatter communities, which ironically make the lines easy to trace. There is, also, a trace of PNR railroad tracks which used to be part of the South Line made with coordinates and compiled into a KML file then plotted on Google Earth available here. Anyone interested can download the file and view the plotted tracks at one’s own desktop using Google Earth. 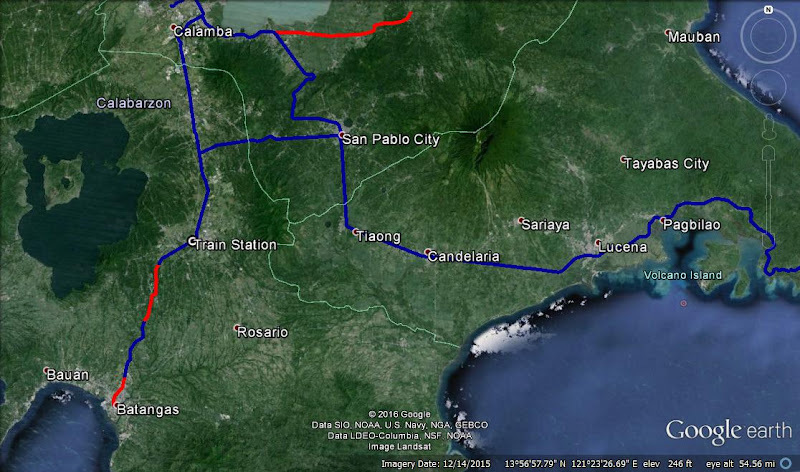 The Batangas to Calamba line plotted on Google Earth. Exactly when public train service to and from Batangas disappeared, I am unable to establish. Based on the very personal memories I have cited in this same article, however, we can all assume that it ended at the very latest in the early fifties but likely even much earlier. The Batangas line, therefore, could have very well been among those tracks that were not rehabilitated after the war. Why it was not, one can glean from the very insights given about the decline of rail transport in the Philippines in general. At the time, the PNR was still known as the Manila Railroad Company. A car of the Manila Railroad Company. Image credit: The blog "A Fly, A Flea, A Find." Decades later and ironically, road congestion is forcing the Department of Land Transportation into a revival of the Batangas line in what is being called the North-South Railway Project or NSRP. Talk of reviving the Batangas railway service has been going on since the Presidency of Fidel V Ramos, so as with many things in Philippine government, the NSRP should be taken with a grain of salt. Besides, the project appears to be entirely reliant upon a Mar Roxas Presidency. On the other hand, who is not dreaming of a hassle-free trip from Batangas to Metro Manila? 6 New north-south commuter railway set, Official Gazette.